So…I may have hit the panic button. The permission slip for the kindergarten trip to the zoo came home weeks ago. I wrote it on the calendar and promptly forgot all about it. The panic hit full tilt that night when I was out with my friends, two of whom also have kindergarteners. We talked about the fact that the kids were riding on the “big” bus (not their mini-bus), and the trip was 45 minutes each way. With the whole kindergarten class and chaperones. And it was going to be hot. And unfamiliar. And a zoo. One friend was telling me about the social story they had been reading with her son. I went home and laid it all out for Tim, who was packing for a business trip. I took a breath. Tim reminded me that if I was really worried about how he would do, I could keep him home. Do something special with him. My panic calmed enough to sleep that night. For two hours. The next morning, I asked Howie if he wanted to go to the zoo. So late Sunday night, I sent off this e-mail to his team at school. Not just his teachers, but the special education teacher, the OT and the BCBA (board certified behavior analyst). I just wanted to check in about the zoo trip on Thursday. Howie didn’t know about it, so I was wondering what had been said to him or the class about the trip. I just had a couple of questions and thoughts about it, to help make it most successful for him. Since this will be his first trip on the big bus, it’s bound to be both exciting and overwhelming for him. He and I have talked about bringing his headphones with him for the ride, and I’m hoping he can sit up near the front and with his aide. He may need a fidget or something to have in his hands for the ride as well to keep him comfortable or occupied. The noises, the smell and the crowds of kids and adults on the bus are going to make it hard for him to sit for the 40 minute ride there, and especially home. Could you create a social story for him for both the bus and the zoo? He’s going to need the same bus visuals to remind him that the rules are the same as they are on Mini 1. He’s also going to need the story to include the rules for the zoo. We’ve been to our zoo twice and both times he’s been very overwhelmed by the sensory overload of the zoo. Again, the smells and the noises are a lot for him, and each visit we’ve had to take lots of breaks and avoided certain areas. I’m assuming that his aide will be his dedicated aide for that trip and not leading a chaperoned group so if Howie needs a break she can take him off somewhere quiet without interrupting the whole group. If you send the story home with him by Tuesday, that will give us time to review it with him so he’s comfortable with both the zoo and bus. I assume his aides will have time to read it with him too. I’ll also make sure we look at the zoo website so he’s familiar with the animals there. If there are any that scare him or make him nervous, I’ll make sure to tell you. I asked Howie if he wanted to go on the trip and he really does, so I know he’ll be motivated to be there. This is his first big field trip so he’s really going to need some extra supports. Additionally, as I wrote in his home log on Friday, Tim is away on a business trip for the week this week. As you may remember, that was hard for him last time Tim was gone (back in November). He’ll need some extra love and care this whole week in addition to the help on the field trip. Let me know if there’s anything else I can do to help make this field trip successful for him. 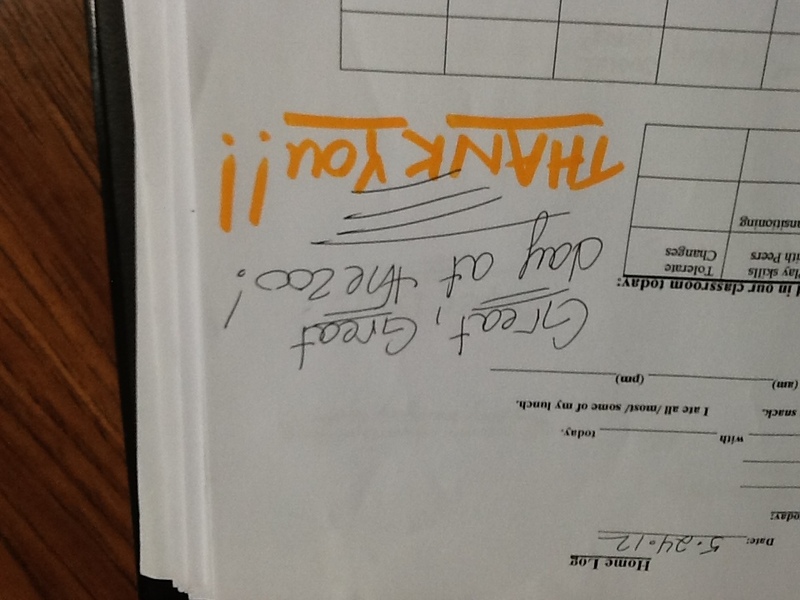 Monday afternoon, Howie brought home a nice social story about the bus ride and the zoo trip. His aide assured me that he would be fine and asked me to send along some extra chewy fruit snacks just in case he needed that sensory input at the zoo. Both the OT and his special ed teacher e-mailed me back to tell me they had it covered and that they were confident that things would go well. I was still on the fence. We read the social story on Tuesday and Wednesday, and he also read it with his home therapist (who, just by chance, had been to that zoo and told him all about it). We investigated the website and saw all the animals. He picked out his favorites. I was still not convinced. I knew that the zoo trip would be a game time decision. As everything always is. This morning was zoo day. His repetitive behaviors were on an uptick. He was hitting himself in the head and babbling. We read the story once again before school. He looked right at me. “The zoo is going to be A-ok”. Well then. Game time decision made. Shoes on and out the door. My stomach was in knots from 7:40 am to 2:00pm. I thought for sure I would get a call to come get him. Once 2pm came around I knew he’d have to be back at school. His bus rolled up at 3pm. I stepped on the stairs to help him off and one of the classroom aides was on the bus. And a huge smile from Howie. So the moral of the story is…it pays to panic. I guess the moral of the story is that I have to let some things go. 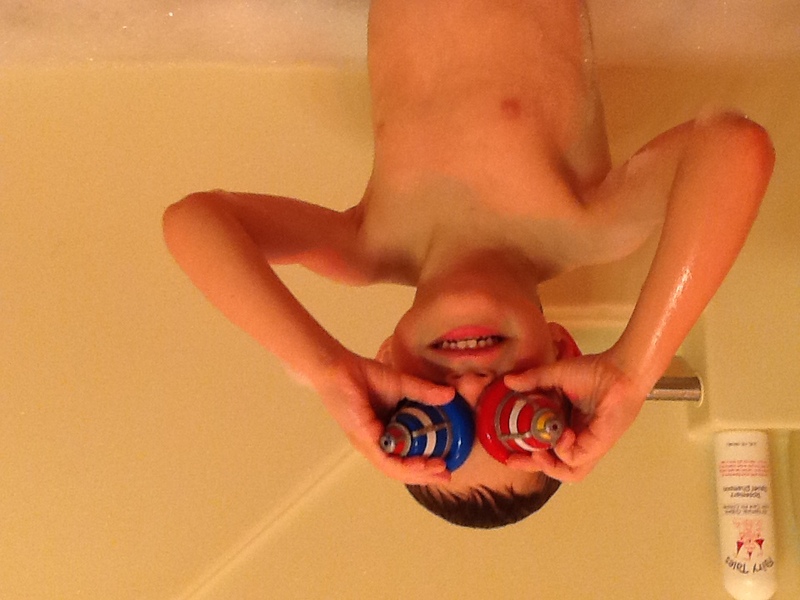 I have to let him try to do the things his peers are doing even if it terrifies me. And we have to make sure he has the supports and the preparation so he can do the things that others do. Him not going would have made him stand out more. My kid ROCKED the zoo today. And I may finally get some sleep tonight. The internet has been abuzz with “The Mommy Wars” – the notion that mothers are in competition with each other over who has the “better” way of parenting. But I’m involved in a different kind of “Mommy War”. It’s not about me comparing myself to the mom down the street or across the country. I’m at The Oxygen Mask Project today, talking about a war that rages inside my own head. Not the battle of Am I Mom Enough. But the battle of Am I A Good Enough Mother? And I have some special friends to thank over there too. And if you haven’t yet, read some of the amazing posts over there. Truly incredible moms and dads sharing what makes them stronger today. Next post could be from you. Hang on, those quotes will make sense in a moment. It feels like a lifetime ago but I remember it so clearly. A gray December day, sitting in the small office of the developmental pediatrician. I was in the back of the room while the doctor was administering the ADOS (Autism Diagnostic Observation Schedule) to Howie. Every once in a while she’d quietly tell me what she was doing, but her eyes stayed on my son the whole time. The doctor tried to engage him in the construction activity, but he just took the pieces he wanted and did it his way. He had almost zero interest in the Birthday Party activity. And the tea party? Forget it. He was more interested in the cars in the parking lot. I had no idea what she was looking for or why these activities were so important. The words “joint attention” and “pretend play” weren’t part of my vocabulary at all. I just thought my kid liked to line up cars and drive them. I didn’t know these were red flags. I saw it. The report was clear. I got it. Fast forward to August 2011. I’m sitting in a different, yet very familiar looking, office watching the doctor administer the ADOS to Lewis. We’re there because his speech is still delayed and his therapist thought there might be something more going on. I watch him engage with the doctor as they play with an airplane. He mimics the doctor’s play skills, but doesn’t take them further. They take out a birthday cake and try to have a party. He plays along but refuses to blow out the pretend candles. In my head I’m screaming, urging him on. We do this at home! Lewis, it’s just like the Lego Duplo cake we make! They hand him a doll and ask him to feed it. He just holds it. They ask him to set a table. He stares blankly. I KNOW what they are looking for. At our follow up appointment for Lewis, the doctor mentions all these things as “red flags” for autism. I argue with her a little. I tell her that he’s the youngest of three boys. We have no dolls in our house and he’s never seen anyone feed a baby. How would he know what to do? And the table setting? Have you seen our house? It’s a miracle if we all sit down to eat together. And let’s not forget that a little knowledge can be a dangerous thing. I have been hypervigilant about the pretend play with Lewis. Hell, I even wrote about it. But I didn’t push it with the doctor. There was enough other “stuff” that qualified him for the PDD-NOS diagnosis. In my head, though, I never let it go. This felt like more of an indictment on my parenting skills and not his actual play skills. I’m sitting in our TV room answering some e-mails. Howie and Lewis are scurrying around in the other room, building something with blocks. The conversation is flowing between them. They are giggling. 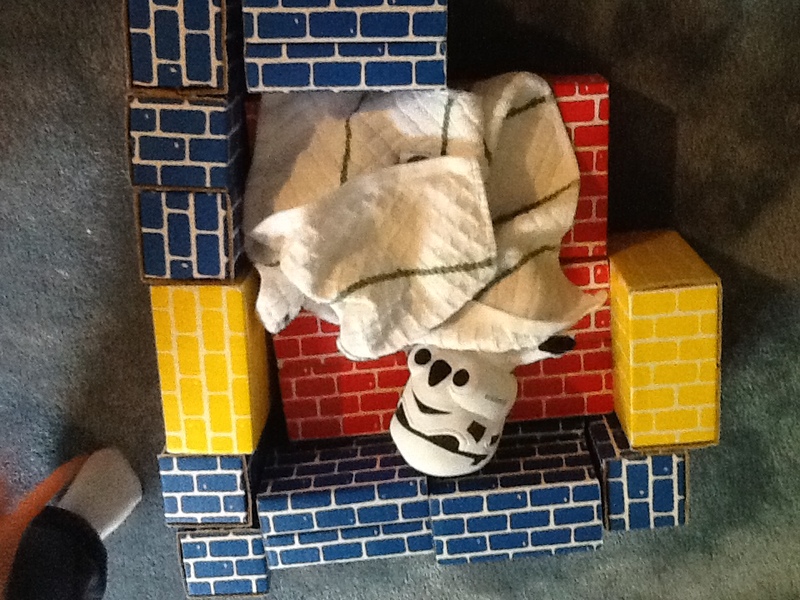 They took their “baby Stormtrooper” and made him a crib. Lewis grabbed the dish towel from the kitchen for a blanket. Yes, this is the result of much therapy and attention to play skills and conversation. Both of them have these goals not only at school but in their home therapy as well. But it struck me that maybe it wasn’t so much a lack of pretend play skills but rather a lack of the “right” pretend play skills. My kids will always beat to their own drummer. You could hand them a doll today and they may or may not know what to do with it. They still like to look at the wheels of cars and will tell you the name of a car just based on its logo. They will build elaborate structures with their Legos but prefer to drive their Hot Wheels through it rather than pretend that people live in it. But they are playing. Together. I’ll take that over a fake birthday cake any day. Those seem like the “right” skills to me. It was simple at first. I got an email asking for some advice. I replied. I am really completely floundering in all this…the bottom line is that I am really just trying to figure this all out on my own. Every time I reach out to our current “team” from Early Education they simply tell me what a wonderful job I’m already doing. Well, that’s nice to hear, but it’s not enough. I KNOW I’m not doing enough. I need someone to give me some tools, some ideas, something that gives us a direction. We haven’t really established a doctor who understands the issues and is working with us. We have pretty much only taken him when he is ill. We now have a medical card for him, but don’t know how to begin choosing a doctor…I don’t want to have to go through trying a bunch to find the right one. But I know I need to bite the bullet and find someone who can work with us. I’m rambling now. Sorry. Bottom line is, thanks for replying, and thanks for listening. Sometimes I feel that I should apologize for taking up people’s time because I know what a precious resource that is. Keep rambling. Yes, we all have things going on. But that’s why we’re here to support each other. I know that floundering feeling. Can I help by asking some friends is they know good docs in your area that have worked with kids on the spectrum? I have some good connections. I know that insurance reform is happening where you live, so hopefully you’ll have some relief there and access to more home help. It sounds like that’s what you need the most right now. Let’s see how we can get you that . Keep talking to me and others. Please. And please remember to try to take care of you too. Just a few moments for you, with some peace and quiet. Let me know if it’s okay to ask around. Anonymously of course. I posted it on my blog Facebook page. I sent out a tweet. I wrote an e-mail or two (or three or four). looking for autism folks in lincoln, nebraska and wichita, kansas for a couple of mamas in need of local connections / guidance. anyone? And 19 comments followed. All parents in those areas looking to connect and offer help. And got several RTs and people making calls and connections. ‏ @xtremeparnthood Calling all #autism peeps: Anyone live in the Lincoln, NE or Wichita, KS area? Looking to help some moms make some connections! @xtremeparnthood @will2455 Thank you! I’ll let @Diaryofamom know you are in Wichita, KS and would like to help! In the span of just a few hours, this mom who previously had no help or support now had a doctor to call, a support center to connect with, and the name of a person working on insurance reform in her state to help guide her. And this incredible community came to her side. People she had never met. People I have never met. When it matters – when a family is in crisis – we joined together. Under the banner of “We Get It”. Without the connections I’ve made online, I’d still be lost. Floundering. I thought there was no one like me. I thought there wasn’t any child like my child. Then I started reading blogs and Facebook pages. I started writing our story. I know what I know about parenting a special needs child because of the people I have met online. These friends made me the advocate and parent that I am today. They gave me hope when I had none. A virtual hand to hold and shoulder to cry on when I had no one. At any time, day or night. They gave me the strength to reach out IRL (in real life). You want to know why I’m on Facebook and Twitter so much? Because I never feel alone. When you write your post, I would suggest that you also really encourage people to REACH OUT in those moments when they feel adrift and alone. No matter how silly it feels, no matter what you worry people may think of you…We are all parents of amazing kids who want to create a world in which they can thrive, and we would do anything to help one another reach that shared goal! On behalf of my friend, I am asking you to get connected. Whether you are just starting on this journey or have been on this road for a while, reach out. Join Facebook groups. Get on Twitter. Make new friends. You are not alone. We may not be there in your house but we are out here and we are just like you. A HUGE thank you to Diary of a Mom and Adventures in Extreme Parenthood and the many who responded, retweeted, and emailed. What you do every day to helps me feel less alone. alternately titled: Holy Crap! My Kid Ate Salsa! Food issues? Yeah, we have a few. Howie’s difficulties with eating go WAY back – starting when he was nine months old and wouldn’t eat anything with chunks in it. Stage 3 baby food? Not happening. Gagging and vomiting led to complete refusal of many foods. Add in his intolerance to anything made with corn, and his diet was extremely limited almost from the start. And he has a long institutional memory for all things that made him vomit. He knows exactly when he gagged on a strawberry for the last time, and can tell me in great detail why a cracker made him puke (it was wet). But we have a few go-to foods. Pizza. Crackers. Granola bars. Cocoa Krispies. A few weeks ago, Tim was sitting at the table, eating some chips and salsa. And then words I never thought I’d hear. Tim and I exchanged glances, figuring this would never fly. The chunky tomatoes and peppers. The spices. The dipping of the chip into the salsa. We gave him a bowl of corn-free veggie chips and some salsa. Yup. Miracles can happen. Three bowls of salsa and 40 chips later I’m a believer. Because holy crap, my kid ate salsa. Tim and I are sitting in the office of the boys’ general pediatrician. We’ve just handed her the Vanderbilt Parent Assessment for ADHD. After a phone consultation the day before with Howie’s developmental pediatrician, I downloaded the form from the internet and brought in to the doctor. I knew that already. In addition to finding the assessment on the internet, I also found the score sheet. Because I’m that mom now. Again, we knew that already. We had done our research. The conversation was not if medication, but which one. I was grateful to have Lewis sitting on my lap. I could focus on him and fight back the tears. I am supposed to meet a friend at dinner time for a political meet and greet. Lewis and I had spent an hour that morning running around, trying to find a place to fill Howie’s prescription. I sat at the kitchen table, fumbling with the medicine bottle. So…I can’t do it. I am a mess. I can’t go tonight. Getting the meds proved to be more of a trigger than I thought. I know this is the right thing. I know this is the next path. Rationally I have no second thoughts. But I am terrified, anxious, worried…and sad. Really really sad. I can’t get my game face on tonight knowing what tomorrow brings. Or might not bring. I kinda just want to cuddle up with Howie tonight as he thrashes around in his skin before everything changes. So I’m sorry. I hope you get it. Well, I know you’ll get it. I really really wanted to go. Really really really. I see the change right away. With one dose. He’s calmer. Clearer. Words and thoughts and feelings are coming out that never did before. His first week on the medication was our spring break week. We are able to problem solve and work things through. His clothing anxieties are gone. I don’t have to sit in the room when he played with his brothers to facilitate play. I wasn’t sure if I was just seeing something because I wanted to see it, but others saw it too. When Howie returned to school, he had his best week in months. School work was fun again. He’s interacting with peers, taking turns, and playing games. He has two amazing soccer practices. Anxieties are back with a vengeance. I pull him kicking, screaming and crying off the soccer field. Acceptance is getting harder to swallow. His aggressions return at school. His beloved bus driver quit and he refuses to get on the bus to go home, instead screaming and flopping to the floor in the principal’s office. I’m called to get him. He tears at his clothes for two hours before finally falling asleep. He tells me he wishes he wasn’t human. I keep him home for a personal day. We make the world’s best marble track and have cupcakes for lunch. He has his best home therapy session in weeks and spends the evening at a friend’s house making homemade pasta. I confirm our appointment with his pediatrician for the next day. I tell our pediatrician about school. She examines him and tries to talk to him about how he’s feeling. He stares at the red airplane with the number 6 that hangs from the ceiling. We agree to take Howie off the medication. I’m trying to accept that. I went downstairs to get a snack. I slid to the floor and cried. I cried because I believe that my son needs some medication in addition to all the behavioral supports he has. But I don’t know how to find the “right” one. I cried because for two weeks I felt like my kid was back. The one that was all full of awesome when preschool ended last year. The one who laughed and ran and played and loved school and everything about it. That is my kid. My kid is not the kid who hits his teachers and screams at his teammates on the soccer field or erupts in a fit of rage when someone takes his toy.